A dog life vest can really boost your dog's swimming confidence. 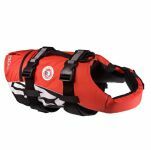 When taking any dog, even an expert swimmer, on a boat it's always smart to bring a life vest for emergencies. Your dog's girth measurement (around the chest) is the most crucial for fit. Keeping breathing passages above water is the main goal here. Length is less important as the back of your dog doesn't need to be out of the water for safety. 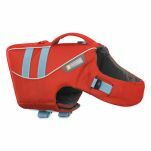 For the most bouyancy under your dog, go for the Ruffwear K-9 Float Coat. It will last a lifetime, and may even save your dog's life! 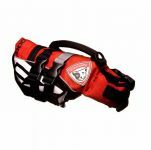 Read our blog for a full run through of our dog life vests.